I live in a rather conservative and traditional city in the South. There are more places to buy cowboy boots and hats than... well, anything with an ethnic flair. The most exotic food you'll find here is sushi and all you'll get is a blank stare if you ask anywhere where to buy a sari in town. So with all that said, I do most of my clothes shopping online. I love authentic ethnic textiles because often times, they are more affordable than the reproductions made popular by any major fashion label at any given time. Also, I've learned that knowing exactly what to type into the search bar will cut down on browsing time significantly. With these few terms you can really take control of your wardrobe and know exactly what you want and what you're looking for. No more "stumble-upons" at thrift stores and garage sales (not that that's a bad thing!). But if you live in a simple rural town like I do, those great "stumble-upon" ethnic finds are a true rarity! 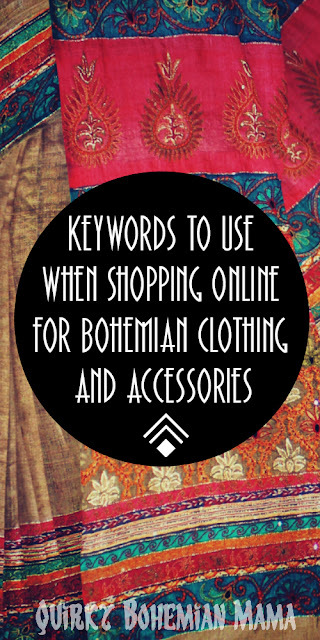 This is the first of a few more posts to come about helpful keywords to use when shopping for bohemian clothing. 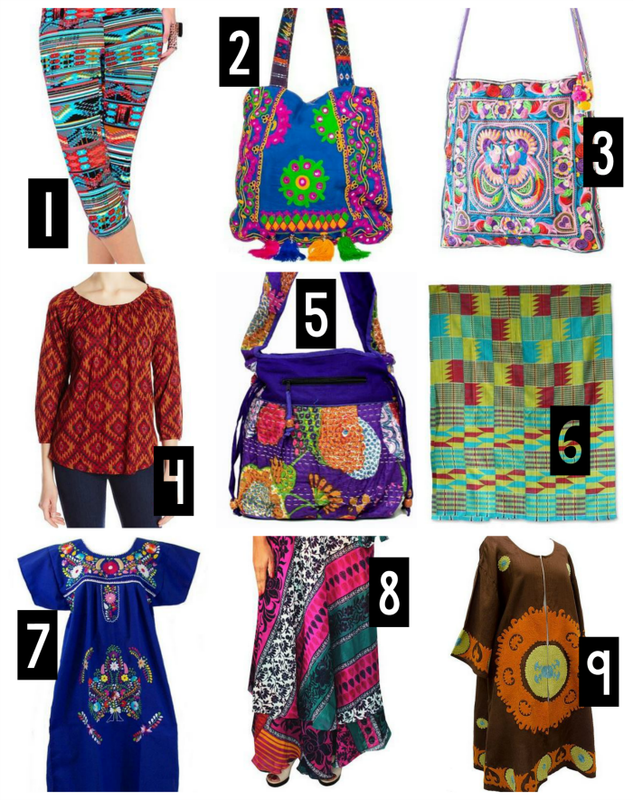 In this particular post, I'll be sharing popular textiles, patterns and prints that bohemians love and their origins! 1. Aztec - a busy print inspired by the artwork of the Aztec, an ancient civilization from central Mexico. Aztec print is a little on the trendy side right now, so if you're a stubborn old anti-fad chick like me, then you'll find comfort in knowing that it's fading in popularity right now. Banjara textile bag. Click for for purchase info. 2. Banjara /Rajasthan - the bold textiles of the Banjara people, nomads from the Indian state of Rajasthan. Often seen in the costuming of American Tribal style belly dancers . 3. Hmong (the H is silent) - the heavily embroidered textiles of the Hmong people, the ethnic group from the mountainous regions of China, Vietnam , Laos, and Thailand. Although you can find Hmong textile clothing, you'll find this style mostly with purses and wallets. 4. Ikat/Ikkat (pronounced "ee-cat" or "ee-kaht") - a material dyed using a method where the threads are dyed before the fabric is woven on the loom. (Pictured above is an ikat printed pattern). Ikat is another textile that has become extremely popular recently but mostly with home decor. Like the Aztec and other "tribal" prints the fad is fading quickly. 6. Kente Cloth - a colorfully patterned cloth traditionally woven by hand in Ghana but is often found as just a print for clothing and accessories in America. 7. Mexican - not a particular type of textile per se, but "Mexican"will bring up those gorgeous embroidered dresses we love so much (often referred to as Oaxacan or pueblo dresses ) along with other styles of dresses and tops that are unbelievably colorful and beautiful. 8. Sari/saree - We know saris are the looooong pieces of silk or light cotton Southern Asian women wrap about themselves so elegantly, but using the term "sari" or its alternate spelling "saree" will bring up stunning clothing made from vintage saris; often found in the form of skirts, scarves , hair accessories and even jewelry . 9. Suzani - a type of embroidered and decorative tribal textile made in Tajikistan , Uzbekistan , Kazakhstan and other Central Asian countries. Authentic Suzani clothing can be a bit on the pricey side, but anything made from the printed reproduction will be significantly cheaper. A scarf made from vintage saris. Click for purchase info. Thank you. So helpful in being specific!